HomeInternet BankingHow to Register/Activate Allahabad Bank Net banking Online? 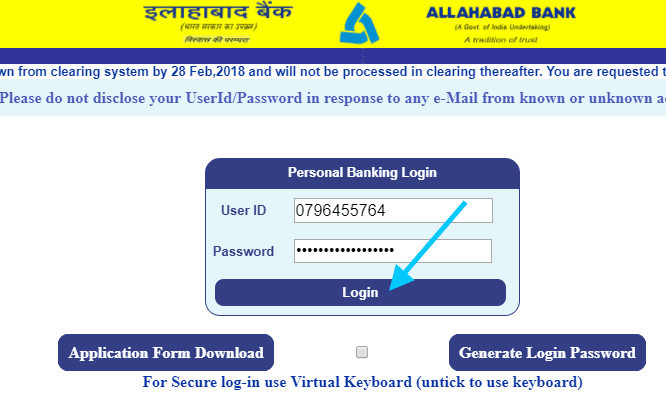 Do you have an account with Allahabad Bank? Do you have full access to its services according to your convenience? All banks have digitalized there banking services including Allahabad Bank. Have you yet activated Allahabad Net Banking facilities? If not, then register for Internet Banking services. You need not visit the bank physically to access the banking services. The traditional model of banking is quite time-consuming, and for the busy lifestyle, Internet Banking is the best solution. Without any difficulties, you can transfer fund from your Allahabad account to other and stay updated with the account balance and transactions. Step 1: Open the web browser on your desktop or laptop and open the official website of Allahabad Bank https://www.allbankonline.in or simply type 'Allahabad Bank Internet Banking' on Google. Click on the official link of Allahabad Bank; you will get directed to the official website of Allahabad Bank. Step 2: Click on 'Continue To Login' button. Next Click on 'Application Form Download', you will get directed to a new webpage, you will get directed to a new webpage, and the page will display an application form which you need to fill up and deposit at the bank. Get the Application Form printed and fill up the boxes as required following the instructions strictly. You need to fill up CIF Number, Date of Birth, Customer Name, Address, Telephone Number, Email ID, etc. Make sure to fill up the boxes without any error and as mentioned in the passbook. Deposit the Application Form at the bank. By post, you will receive the User ID for Internet Banking. You can use the User ID to Login to the Internet Banking services. 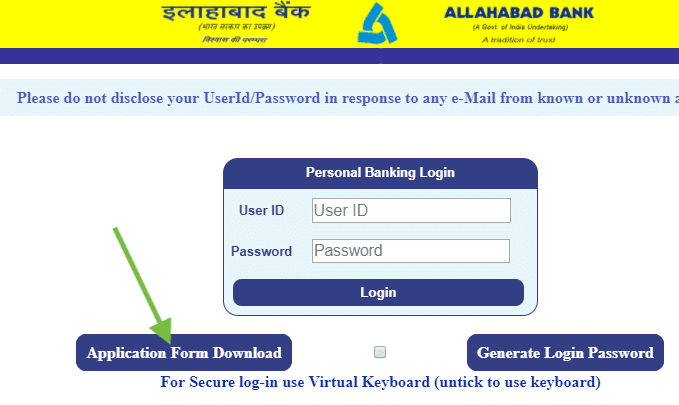 Step 3: Again Open the official website of Allahabad Bank for Internet Banking Services. Click on 'Continue to Login' and on the next page click 'Generate Login Password'. Step 4: You will get directed to a new page where you need to enter the User ID and registered Mobile number in the provided boxes. Click on 'Submit' button after entering the credentials. Step 5: Again you need to verify user id by entering one time password sent to your registered mobile number. Step 6: After clicking on 'Submit' button, you need to create a password for your Internet Banking account. You can also create new user id of your choice. 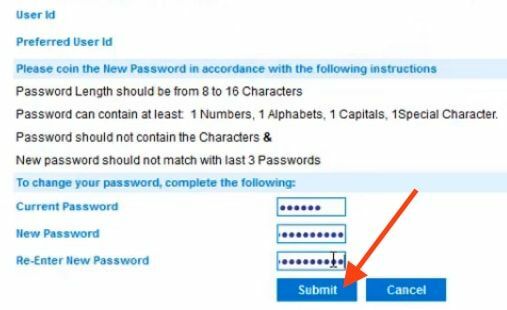 Note: Make sure to enter a strong password consisting at least eight characters which include alphabets, special characters and numeric. Once your password gets generated successfully, get back to home page. 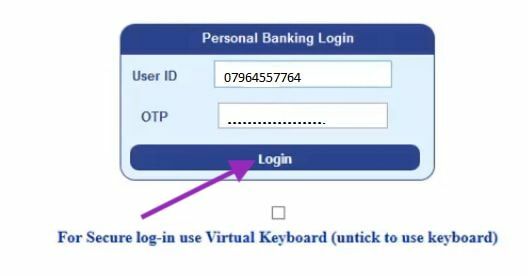 In the Personal Banking section, enter the User ID and Password in the provided boxes and click on 'Login' button to use net banking. You need to follow few steps and activate Internet Banking facilities! You can activate and register Allahabad Net Banking online and access the Internet Banking Services. You can transfer funds and stay updated about the transactions. You can access Internet Banking Services anytime and anywhere without accessing the bank physically! SAR JI NAMSKAR SAR Mujhe ALLAHABAD BANK KA NET BANKING CHAHIYE LIKIN MUJHE MIL NAHI PA.....SAR JI KYA TAM KE MADHYAM SE NET BANKING CHALU HO JAYEGI JIS PRAKAR SBI ME CHALU HO JA RAHI HAI. I forgot my user id and password. How to get it back. I want to create a user id for my net banking account. I applied for my net banking Allahabad bank chandkheda branch before 3 months around still I didn't get my user id and password. 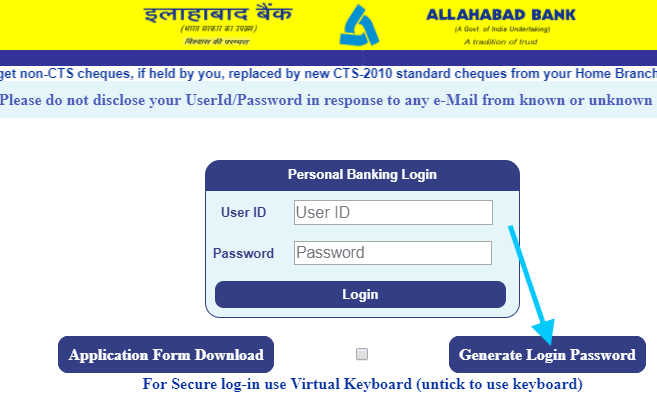 How to create Allahabad net banking account. Sir Kya net banking bina debit card ke ho sakta hai? error coming like you request could not process please try after some time. I am not able to log in my account to Allahabad net banking account. contact related branch. or if you have userid, then you can generate password online. i registered for bob net banking but unable to active it properly please help.